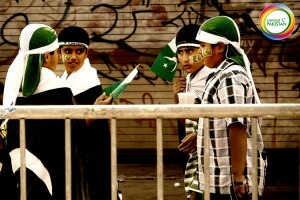 Today I address you…yes you, the one who call themselves the youth of Pakistan. I am directly referring to the people who have lost their loved ones in terrorist activities, ones who are or have ever been bullied, abused, harassed just because of their nationality, the ones who are alone and feel like they don’t fit in, those who are jobless or going through severe turmoil and planning to abandon their nation just as the nation abandoned them. Listen to me carefully! I entered this world helpless, vulnerable and many predicted that my survival was almost impossible but in contrary to their beliefs, I survived. It was indeed a roller coaster ride, as the nation once respected became the most dangerous. But all of it is a mere facade created to demoralize us because our country is unique for several notable reasons which rarely or never get the attention they deserve in world media. You may feel like your life is at a stand still, like nothing is even worth it as that is all you witness but it won’t go on forever. I don’t care if we are Sindhi, Punjabi, Balochi or Pathan; you deserve to wake up every morning and smile. No one has the right to judge you or to tell you that you are not good enough. There are no good and bad leaders, only good and bad people who advise those leaders so do voice your opinion. If there is something you think is not going right, share your views and let the world know how you feel about it but do it all productively. You aren’t going to get justice through fueling tires and taking innocent lives. Make sure that whatever road you choose, it is the one you can live with. Be brave to take chances and don’t ever miss opportunities. It might change your life in a way you have never imagined. If you don’t take some calculated risks in life, you will never get to where you want to be. I promise you this that everything will fit into place and you will finally be able to see me reaching heights again but only if you work hard and never differentiate among your fellow Pakistanis. Every day is a new day and no matter what is wrong, there is always an answer. Keep going and never ever give up on me or on yourself. Excellent stuff and must be published in Dawn or Express Tribune. I like the optimism in your post; just the thing this country needs a huge dose of!